Find a penny, pick it up, and all the day you’ll have good luck! 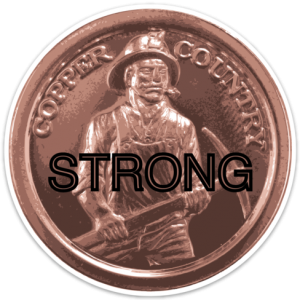 We the people of the Copper Country could use some luck and support right now. Each of us are doing what we can to help our neighbors and friends and certainly are showing we are Copper Country Strong! Show your support by purchasing a 5 inch sticker for $5 each. Our family and friends in the Copper Country lost homes, experienced property damage and more. ALL proceeds will go towards the flood fund set up at Keweenaw Community Foundation. Please let us know if you’d like to purchase a sticker or two or three. We will gladly mail stickers to those of you out of the area. Stop in at Nitro Consulting’s office and purchase during business hours or send a message to arrange mailing to you! Cash and check only. Thank you!